BOGOTA, Colombia (CNN) -- Colombian President Alvaro Uribe admitted Wednesday that the symbol of the neutral Red Cross organization was used in a hostage rescue mission that freed 15 people from leftist rebels two weeks ago. "This officer, upon confessing his mistake to his superiors, said when the [rescue] helicopter was about to land ... he saw so many guerrillas that he went into a state of angst," Uribe said. "He feared for his life and put on the Red Cross bib over his jacket." 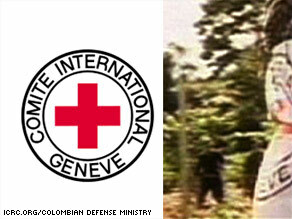 The ICRC mission in Bogota said in a written statement that it "noted" Uribe's announcement. The ICRC mission in Bogota said in a written statement: "As guardian of international humanitarian law, the ICRC reminds that the use of the Red Cross emblem is specifically regulated by the Geneva Conventions and its additional protocols. "The Red Cross emblem has to be respected in all circumstances and cannot be used in an abusive manner. "The ICRC as neutral and impartial must have the confidence of all the sides in the conflict in order to carry out its humanitarian work." "If you use the emblem in a deceitful way, generally the conventions say it would be a breach. [Based on the information as explained to me,] the way that the images show the Red Cross emblem being used could be distinguished as a war crime, " Ellis added. Uribe and his top generals had categorically denied that international humanitarian symbols were used in the July 2 rescue mission that freed the prized hostages.